Arcade – Arcade and Attica Railroad, Rte. 39 & 98. Attica – Attica Historical Museum, 130 Main St.
Angelica – National Historic District. Interesting architecture on Main St. & Railroad Station. Batavia – Holland Land Office (museum), 131 West Main St.
Caledonia – NYS Fish Hatchery, Rte. 36. First in North America. Big Springs Historical Society and Museum, 3095 Main St.
Castile – Yard & Craft Sale Weekend. Heritage Day & Public Chicken Barbecue. East Bloomfield – Bloomfield Academy Museum on Village Green. Geneseo – Livingston County Historical Museum, 30 Center St.
National Warplane Museum, Big Tree Lane, off Rte. 63. 1610 Welch Road, North Java. LeRoy – LeRoy House (museum) and JELL-O Exhibit, 23 E. Main St.
Lima – Museum, Historic Home Tours by Appointment. 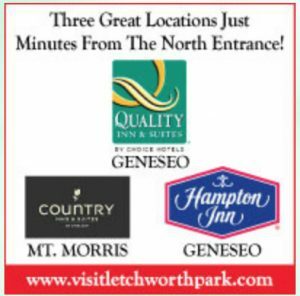 Mount Morris – Letchworth State Park Entrance, Rte. 36. General William Augustus Mills House, 14 Main St.
Mt. Morris Dam (largest concrete dam in Northeast), Letchworth Park. Mumford – Genesee Country Museum, off Rte. 5, 20 miles SW of Rochester. Perry – Perry Public Library Art Gallery, 70 N. Main St.
Pike – Wyoming County Fair. Warsaw – Gates House Museum, Perry Ave.
Middlebury Academy Museum, Rte. 19. Gaslit Streets.